Technology and exercise have a symbiotic relationship these days. From wristwatches that can clock a runner’s heart rate to electronic exercise machines that can regulate weight, there are all kinds of unique developments to make tracking one’s progress easier. Even the idea of using an old fashioned notebook and pen as an exercise planner seems a little cliché these days. For that reason many people are branching out and using their computers to keep long-running records of their performances. All it takes is a simple spreadsheet, and the right exercise planner Excel template, and creating exercise records and future plans is a snap. Spreadsheets are the go-to document for creating an inventory of tasks that needs to be completed, or to keep a running account of something. Sweat equity is no different, and that’s why Microsoft Excel is the ideal program to keep track of how many push-ups, bench presses and crunches someone has done. For those who want to get serious about their workouts, there’s even a free exercise planner Excel template that will help them keep better track of what they’ve done, and what they need to do. All someone has to do is download the exercise planner Excel template and save it in a memorable location. Once someone has the exercise planner Excel template, all he or she has to do is open it up and fill in the blanks with the number and type of workouts that have to be done. Simple save the altered document with a different, easily indexed name (something like “weight lifting workout 1/16/2013”) and that, as they say, is that. 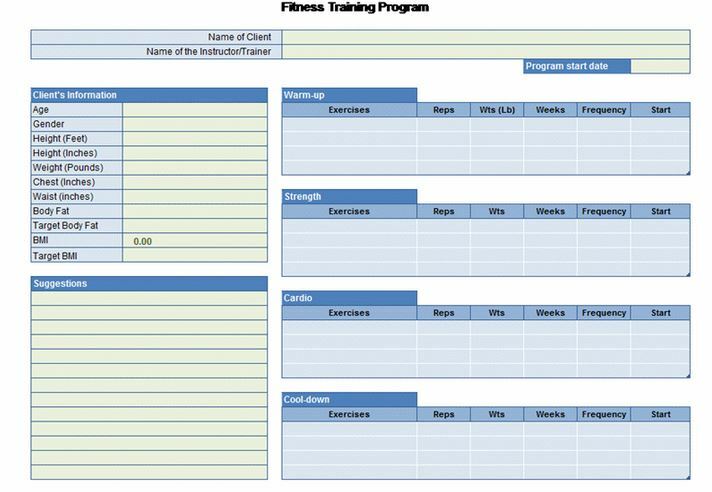 This exercise planner Excel template is simple, and easy to use. All someone has to do is make up a new sheet for every workout date, and then check off the items as they get done. It’s even possible to print out a sheet with the exercise accomplishments left blank like a checklist. For those who prefer a physical copy these sheets can be saved in a binder, providing a backup of one’s exercise planner. In addition to being free and easy, there’s no maximum amount of times one can make use of this exercise planner Excel template. If the original template that someone downloaded got messed up somehow, then all that person has to do is download a fresh copy. Once that’s done it’s back to business as usual in the gym.